George Sibley Tyson was born in Randolph County, North Carolina on September 4, 1864, the sixth and youngest child of William Nicholas Tyson (born July 25, 1823; died November 5, 1896) and his loving wife Mary Adaline Sibley Tyson (born September 3, 1829; died October 23, 1893), who moved from Montgomery County in the early 1860’s with their children, including George, to what is now known as the Bethlehem Community of Union County, North Carolina (near present day Furniture Factory Outlet World). George S. Tyson was a soft-spoken man, introverted and shy. 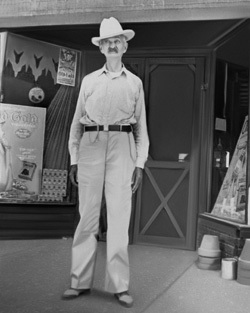 Born with a birth defect affecting his left leg (it may have been shorter than his right), he sold bibles as a young man, and entered into the mercantile profession rather late in life, running a general store as a partner with several of the early Waxhaw merchants. 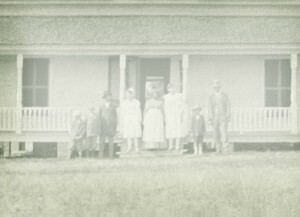 He listed himself as a “Dealer in General Merchandise” in the 1900 Census, and he resided as a boarder in the home of Mary Isabelle Simpson Robinson, a widow, who farmed a large tract of land south of Waxhaw together with her nine children. It was here that George met Mary Alice Robinson, whom he would later marry. Mary Alice Robinson (born August 5, 1874) was the beautiful, red-haired daughter of William Robinson and Mary Isabelle Simpson Robinson. George was immediately smitten by her, and courted her for some time before she agreed to marry him on May 8, 1902. A portrait of her presently hangs in the hallway of the law office. George was 38, the blushing bride was 28, and together, they had four children: Marybell Tyson, born August 11, 1903; William Robinson Tyson, born August 19, 1905, George Sibley Tyson, Jr., born August 25, 1907 and Mattie Tyson, born January 21, 1909. After a fire destroyed their small home outside Waxhaw in 1907, the Monroe Journal reported on January 19, 1909 that “Mr. G.S. Tyson, a well known country merchant at Wilson’s Old Store, has moved his family from that place to Waxhaw. He is placing material for the erection of a nice residence on his vacant lot in the eastern part of town.” This lot was next to what would soon be his new general store. Unfortunately, Mary Alice died on May 14, 1910 at the age of 35 from tuberculosis. It is not known how long she lived in the new home. A few short months later, on August 17, 1910, their infant daughter Mattie also passed away. Mary Alice and Mattie are buried together at the Round Top Church in Waxhaw. George remarried to Barbara Blythe in 1921. 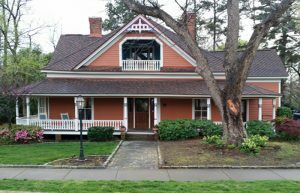 During his life, George S. Tyson operated a small general store in Waxhaw located next door to the Tyson House. For all of his life, George was a devoted member of the Waxhaw Methodist Church. George S. Tyson died on August 26, 1943 at the age of 79. He is buried in the Waxhaw Cemetery. 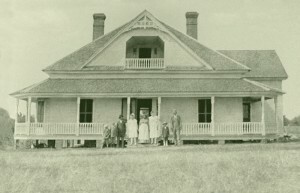 Mr. Groves and his wife, Elizabeth, purchased the George S. Tyson House in 2004. Architecturally, the house is remarkable for it double-pile, hip roofed appearance, which was very popular at the beginning of the 20th century. The house features a turned balustrade which carries between ornate posts on the hip-roofed, low slung, wrap-around porch. All of the original spindles have been restored by Mr. Groves, and all vinyl siding has been removed in order to dutifully restore this lovely home. Special detail was given to the window trim on the front porch and at the main entrance door. The front door itself, though modern, is very close in style to the original. The central gable at the front originally featured a recessed porch, which was completely enclosed later by previous owners, for reasons unknown. However, Mr. Groves has resurrected and restored this amazing porch to its original glory. Although each gable end of this fine home featured a hand-sawed spindle bargeboard, only the gable end on the western side of the house remained when the Mr. Groves purchased the home. This one remaining bargeboard has been carefully copied and replaced by master craftsmen and now adorns the western gable again, and identical bargeboards are being crafted for all other gable ends. Finally, beautiful stretcher bond chimneys reign over the house with a wonderfully intricate corbelled midsection and top feature.